African Wildlife Foundation chief executive says that without stopping the pace of development, African governments can still make better choices to ensure wildlife thrives in a modern Africa. He spoke to Allan Olingo about his priorities as he takes up his new role. This is an exciting time because I have always believed that for conservation in Africa to work, it has to be led by Africans. My top priority going into this new role is to push for more African participation in this sector. We want to see more African-driven investments in conservation given the very direct benefits that accrue to us. I want to push not only for African-led conservation initiatives but also for more benefits to local communities from conservation. We have to own it; these are our resources and our landscapes. Finally, I want to see more young people participate in conservation, not just as members of wildlife clubs but also at policy and leadership level. AWF pioneered youth involvement in conservation in the 1960s by founding the wildlife clubs in the region. We are also working with the Global Youth Biodiversity Network to groom the next generation of conservation leaders. I believe the youth are not leaders of tomorrow as politicians are wont to say; they are leaders of today. There are concerns that conservation in Africa is "too white," and that the entire ecosystem is rigged against Africans. Is it time for an African revolution in conservation? We do not need any revolution to do what is good for the environment we live in. It is the responsibility of Africans to own the conservation narrative. In the absence of our own African initiatives, someone has to take the responsibility and it doesn't matter whether they are black or white. Africa's natural capital is a global resource and the responsibility to conserve it is a global effort. We acknowledge the support of our partners outside the continent. My challenge now is to African elites, investors and governments to use their money and energies to protect our natural heritage. Africa is urbanising fast and the population is also growing rapidly. What is the place of conservation in this new Africa? Africa can craft its own development model that does not include the destruction of the natural environment. We have seen other countries in Asia, Europe and North America, which prioritise economic development over the environment and they now have to deal with the devastating effects of neglecting their biospheres. Asking Africa to pick between conservation and economic development is a false choice. Without stopping the pace of development we can make better choices to ensure wildlife and wildlands thrive in a modern Africa. African governments can still build roads, railways and bridges and conserve wildlife and wildlands as well - after all we have the technology to reduce destruction of habitats and displacement of people. But conservationists have to be in the room when decisions are being made by government and private sector to ensure that African wildlife and wildlands have a voice in the continent's development blueprint. Increasingly, we are seeing countries opening protected areas for natural resources extraction/exploration. What does this mean for the future of Africa? It is a fact that only a few countries in Africa are mineral-rich and that most of the continent's wealth is above the surface. Africa needs to be smarter about not prioritising what is under the soil over water towers, rivers and lakes, healthy soils and the rest of the natural ecosystem that sustains its people. Until we change our view of the economic benefits of protected areas vis a vis the exploration of mineral resources, we will continue to fight a losing battle. Governments need to look beyond the direct capital injections from these mineral explorations and instead focus on the multiple effects of conserved landscapes on the economy -- tourism, transport infrastructure, water catchments, food security and a host of other benefits directly linked to the natural environment. How can communities living in wildlife rich areas benefit from these resources? Tourism and conservation can directly benefit local communities if executed well. It should be understood that conservation is not just for tourism. It is for development, and it should especially leave local communities better than it found them. Tourism and development are by-products of conservation. AWF has invested over the past decade in tourism in Uganda, Kenya, Tanzania, Botswana, Ethiopia, Rwanda, Zambia and Namibia. We do not invest in tourism for the sake of tourism. We invest in tourism as a means to drive conservation outcomes and community benefits. In Rwanda, for example, AWF pioneered community-ownership of high-end ecotourism lodges through the creation of Sabyinyo Silverback Lodge, which is managed by Governors' Camp. Since opening in 2007, the lodge has generated over $2.9 million for the community. The community is receiving substantial revenue from the lodge and they are supportive of conservation. This is the kind of change and tourism development we need across Africa. What role does technology have in helping with conservation? Technology is exciting and has been a game changer in how we approach conservation. Our GIS team at AWF, for instance, has developed maps that identify the most critical areas for surveillance to ensure that ranger resources are optimised and used to the best advantage. Using these maps, rangers can identify not only the areas that have the heaviest wildlife populations but also those most vulnerable to threats and deploy response teams in time. In some places, drones are being used in surveillance. We are also discussing how we can use technology to promote our parks. Imagine sitting right at your home, office and through virtual reality, sharing in the offerings of the African parks in real time? This is one of the reasons why it is so important to include young people in conservation. They are digital natives and they will champion innovations that will push conservation to the next level. Do you believe African governments are doing enough in terms of funding conservation efforts within their jurisdictions? Not yet, but they are beginning to step up following campaigns by key conservation stakeholders. 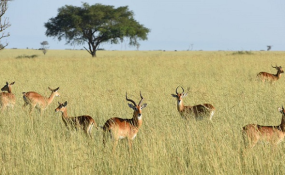 The budgetary allocations for conservation initiatives are going up in several African countries and we are also seeing a lot of participation by conservationists in key government decisions. The future looks bright. Some conservation challenges to hit the headlines last year include the botched translocation of rhinos in Kenya and the mass deaths of elephants in Tanzania over suspected poisoning. Looking at the bigger picture across Africa, how well would you say that our animals are faring against threats to their survival? We cannot ignore the heavy losses we have suffered but I would like to point out that there has been a lot of good news as well. Elephant and rhino populations in several African countries where AWF has active projects are stable or increasing. The number of mountain gorillas in Uganda, Rwanda and the Democratic Republic of Congo is also up. We are working very hard to turn the tide but the triple challenges of poaching, trafficking and illegal trading are still a grim reality. The message is clear - there is nothing inevitable about conservation challenges in Africa. We can preserve the continent's precious wildlife heritage with strategic and coordinated efforts to stem the killing, disrupt the trade routes, aggressively prosecute suspects, and dampen demand for wildlife products.